Check also GE Photo layer! I am to collect as much as I can locate on GE. 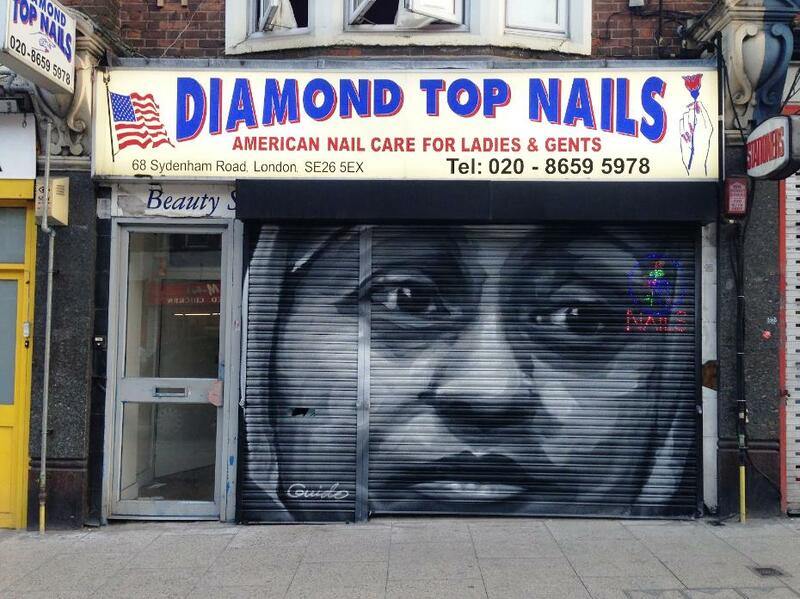 Attachment will be updated by every new findings of his great photorealistic murals placemarked. Recent stage of updates: 70 murals in folder. Attached kmz file only available here on the every-time "Live" GE Community Forums, which is now self-sponsored. If You make good use of this dataset, please donate our community! Thank You! Another silo. To make it exciting, this time an Eternit silo. 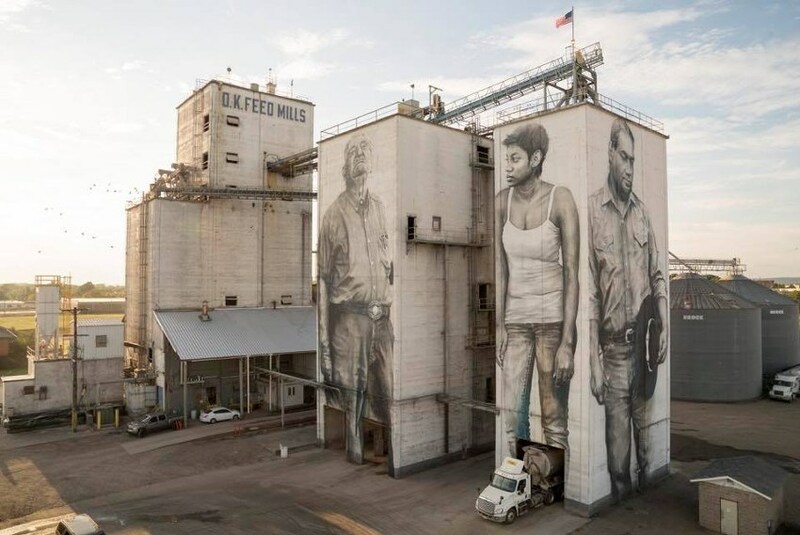 Guido van Helten’s stunning portraits at OK Foods’ grain towers in Fort Smith have transformed three mundane agricultural buildings into artistic monuments that celebrate diversity across the ages. 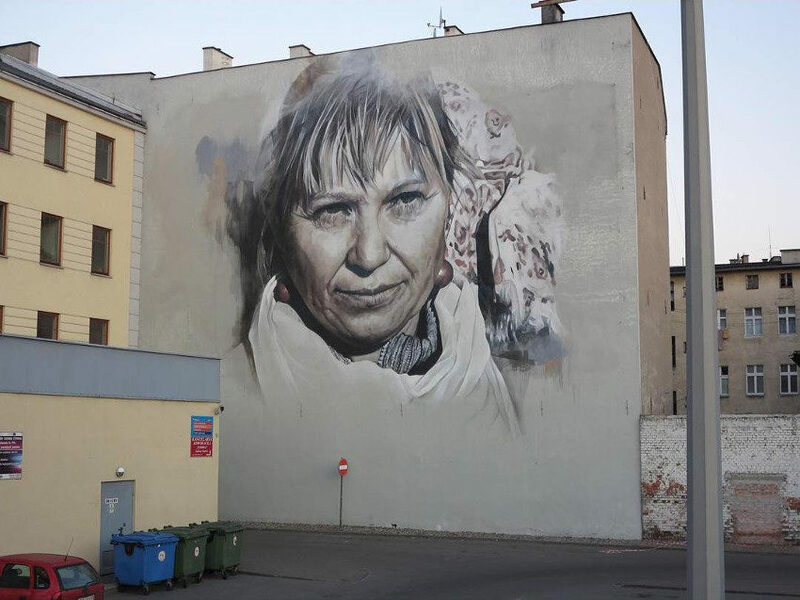 In town for the JJ Street Baltic Session 2015, the talent muralist once again created a striking piece of work entitled “Saarepiiga”. 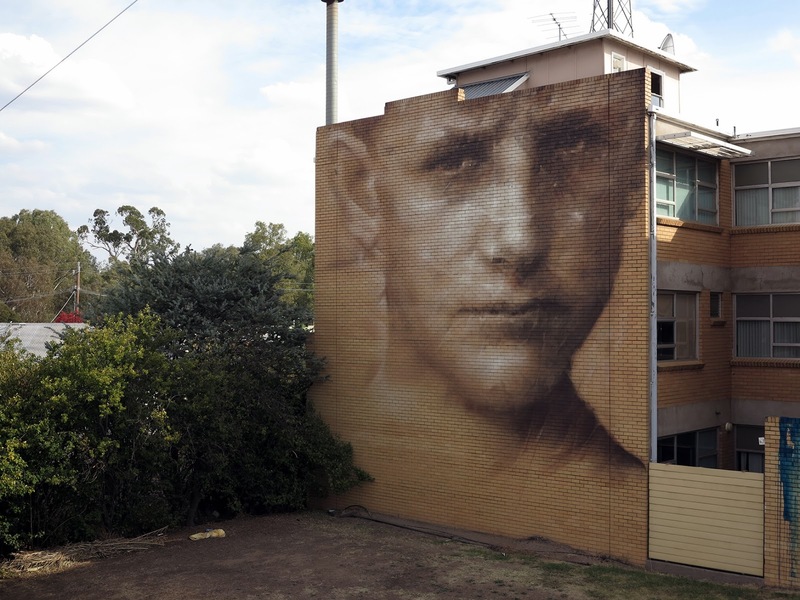 As usual, Guido Van Helten painted a beautiful vintage portrait which will surely be enjoyed by the local residents. The ... mural painted from images from the archives of the Aboriginal Legal Service, first started in a shopfront in Redfern in 1970 providing free legal advice and services to Indigenous Australians. According to the artist, this was a vital step for Indigenous Australia who continue to fight discrimination to this day. The image relates to the Aboriginal Legal service childcare in Moree and appears as a deeply nostalgic piece with a great sentimental quality rendered through his characteristic watercolour like style. This project was coordinated by Workshop Australia. 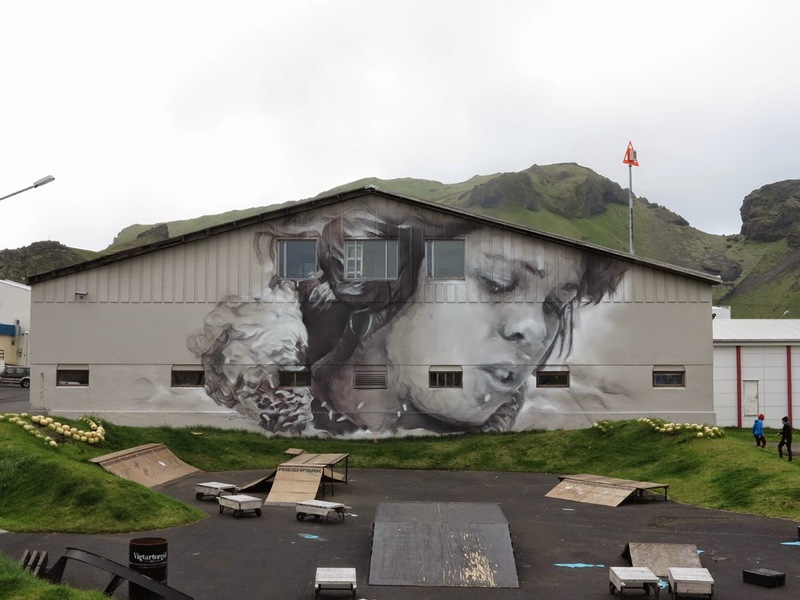 This piece is the first part of a series of walls painted in the harbour of Heimaey, Vestmannaeyjar. This small community is the site of the Volcanic Eruptions here in 1973 in which the town and community was nearly abandoned. This painting is based on the image of island local Halla Svavarsdottír sowing new vegetation on the mountain Heimakletti after the eruption in 1976. 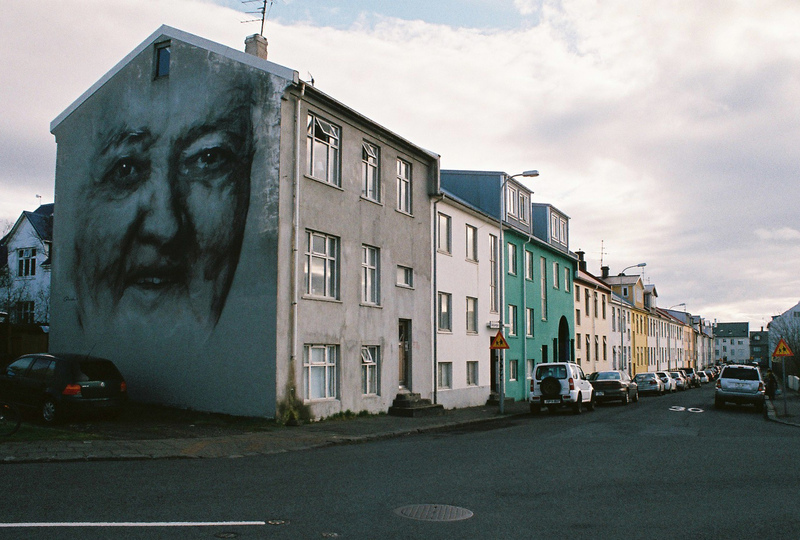 The image was referenced from local photography archive Sigurgeir ljósmyndari by Sigurgeiri Jónasson. No StreetView and no relevant GE Photo layer content, only if the one Panoramio shot that helped me to identify the building. 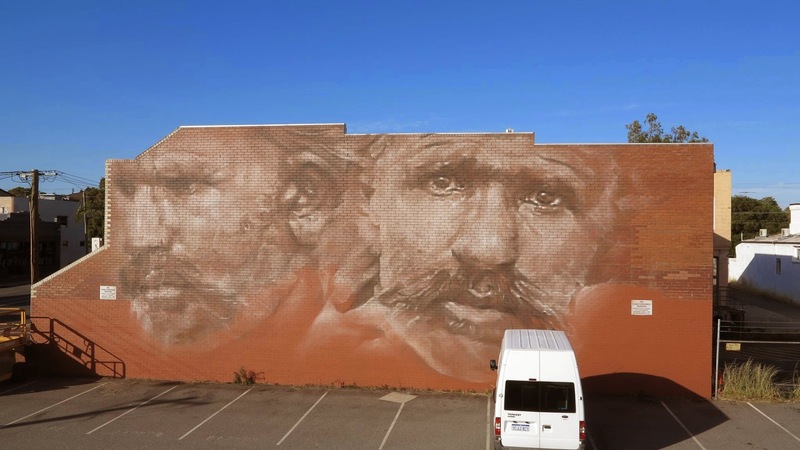 ...This wall is painted from the image of a boy Ned Kelly’s nephew, standing at the Kelly homestead in Greta West, just outside of Benalla in 1922. Related from board: The Ned Kelly GE Tour by TomKjeldsen! Both were made by the occasion of the Wall to Wall Festival. ...portrait based on ‘Certificate of Exemption from Dictation Test’, an immigration document of an Afghan Cameleer ‘Said Kabool,’ from Western Australia in 1916. "Dictation tests were an immigration method designed to keep non-white migrants out of Australia under the immigration restriction act in 1901 (white Australia Policy.) Many Afghans were exempt from these tests however as they existed as the backbone of Western Australian economy, supplying mining towns through the desert with their camel trains. The Afghans also built the first mosques in Australia in the 1860’s and the first Perth mosque in 1905, which was recently vandalised along with 2 other Islamic sites in Perth. Well, after this amount of research on this guy and after these words I can say that he really is a gifted and true young man! 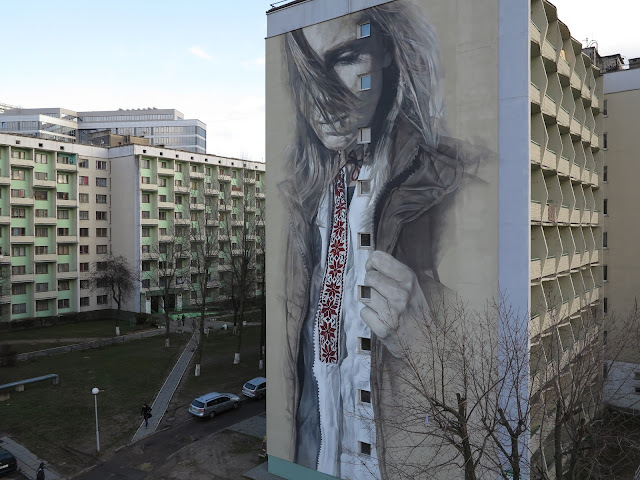 Australian artist Guido van Helten has just completed a large-scale mural in Avdiyivka, an eastern Ukrainian town in ATO territory (anti-terrorist operation zone), first front line. In Mid-April 2014 pro-Russian separatists captured several towns in Donetsk Oblast including Avdiyivka. In July 2014, Ukrainian forces reportedly secured the city from separatists. Ukrainian forces kept control of Avdiyivka, which became a frontline city and is frequently shelled. According to the OSCE the area between Avdiyivka and neighbouring separatist controlled Yasynuvata is one of the hotspots of the War in Donbass, that has killed more than 9,600 people. Even though the frontline city is frequently being shelled people still remain and live amongst the conflict. 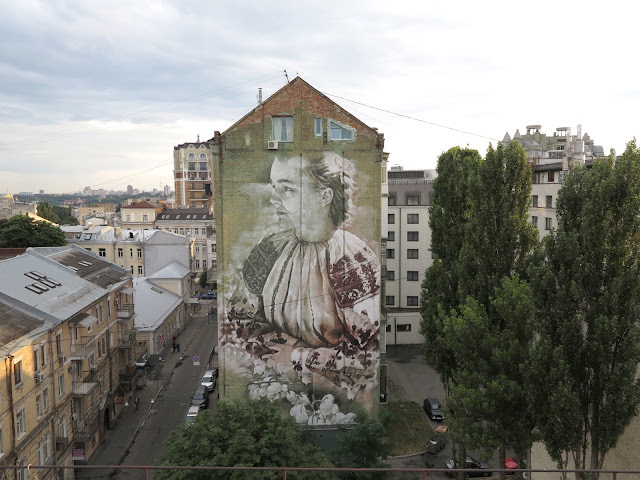 Guido van Helten visited a local school to photograph 73-year-old teacher Marina Marchenko, whom he chose because of the kindness he saw in her eyes from a photograph. While working, they heard hundreds of shots every day. The signs of bullets can be seen on the building where they were painting. Bullet proof vests and helmits were worn by the artist and photographers. No.31-34., a 4 pieces set from Glasgow, Scotland. 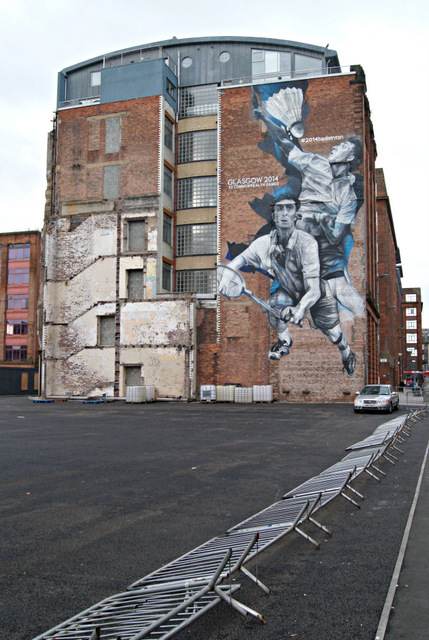 ...the graffiti style murals depict netball, field hockey and rugby sevens which are three of the sports on offer at the 2014 Commonwealth Games which were held in Glasgow. 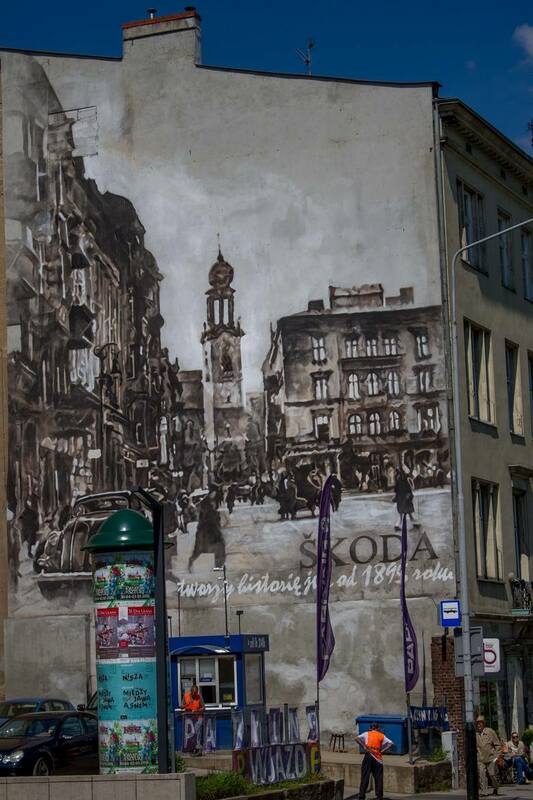 The same artist is responsible for the badminton mural at Wilson Street in the city centre. April 26., 2016. - 30th anniversary of the worst nuclear disaster the world has ever seen. In the early hours of April 26, 1986, the Chernobyl nuclear power plant in Ukraine (formerly part of the Soviet Union) exploded. The explosion tore through Chernobyl’s No. 4 reactor, near Pripyat, Ukraine, more than 30 people died and countless others have died from radiation symptoms since. The Ukraine government evacuated some 135,000 people from the area and the 19-mile exclusion zone around the plant will remain uninhabitable for human habitation for at least 20,000 years! Today the area is still a ghost town, wildlife has returned, however animals with high levels of cesium-137 in their bodies have been found, stunted trees and conjoined flowers are reminders of the disaster. 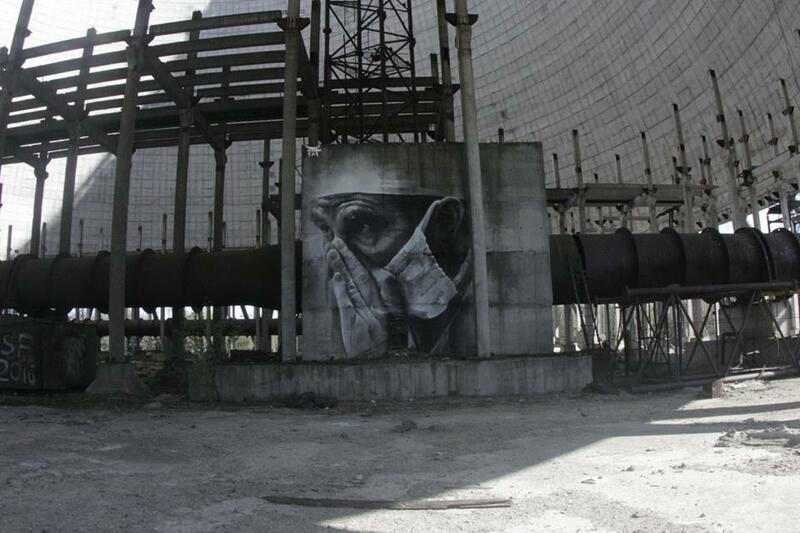 To acknowledge the 30th anniversary street artist Guido van Helten went to Chernobyl, Pripyat (the city-ghost, exclusion zone) and never done before, he completed a mural inside a reactor!! This unique project was organised by ArtUnitedUs and curated by Geo Leros, Iryna Kanishcheva, Waone Interesni Kazki, Ilya Sagaidak. 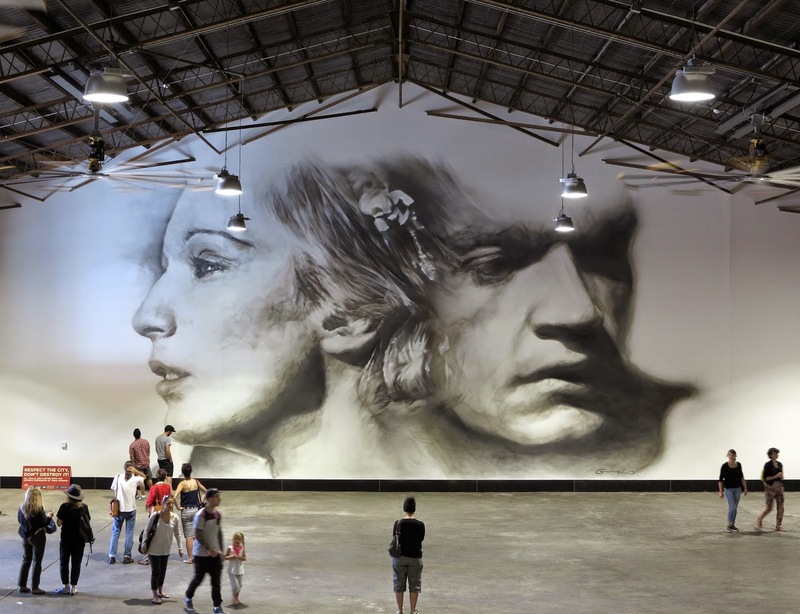 Australian artist Guido Van Helten, working in his photorealistic style, created the painting from a photograph taken by renowned photojournalist Igor Kostin, famous for first documenting the disaster as it happened in 1986 and over time documented its destruction. His brave efforts exposed him to five times the acceptable level of radiation, and he was inflicted by illness related to this exposure. He died in 2015. The work was created with assistance from the Chernobyl district authorities inside disused and unfinished Chernobyl Reactor 5, which was under construction at the time of the accident. 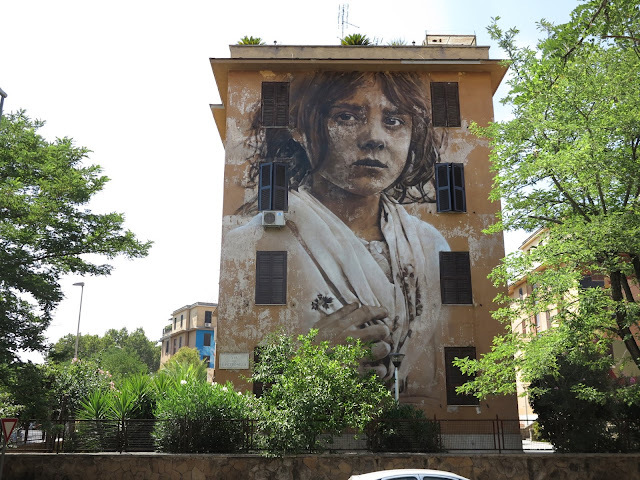 ...was invited by the guys from Big City Life to work on a large mural in the district of Tor Marancia, Rome. 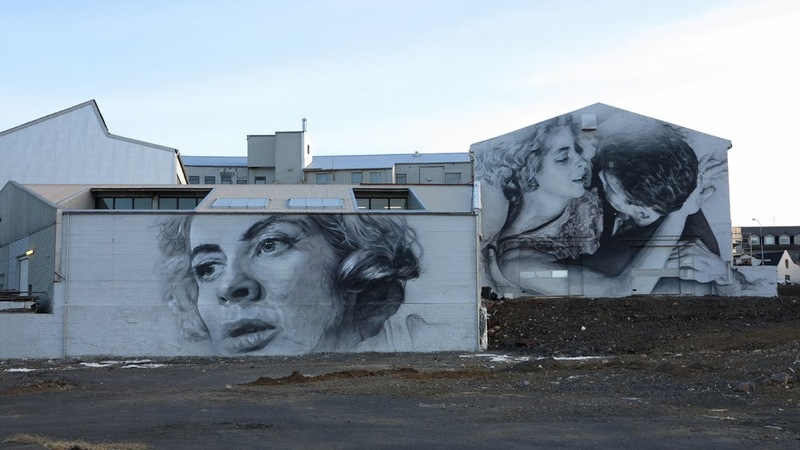 In August 2015, film director Selina Miles travelled with artist Guido van Helten to Akureyri, a town on the north coast of Iceland, to produce a very unique piece of work. 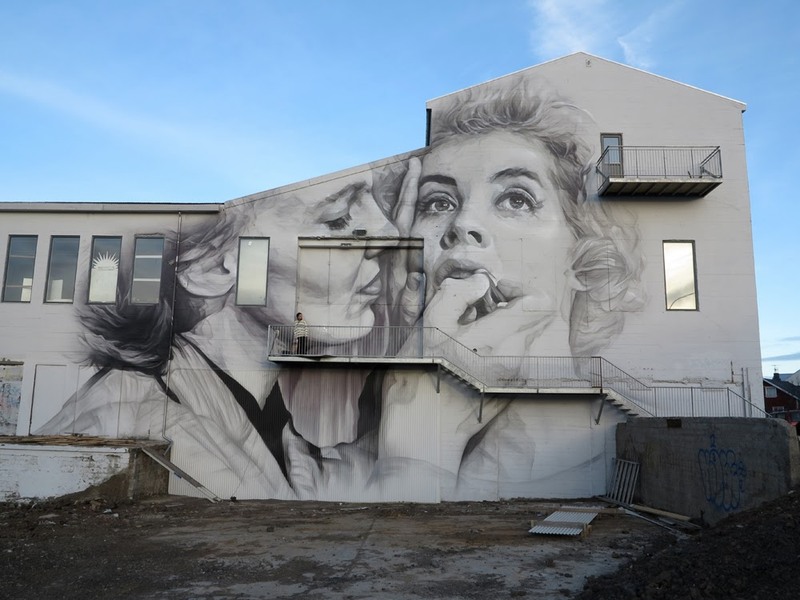 ...to paint one of his portraits onto the side of a working boat, facilitated by the Akureyri Cultural Office. Guido had wanted to paint a ship for a long time and the ship he paints ‘SÆFFARI’ travels to the small island of Grímsey. It is the only ship that goes there on a regular basis as it transports their produce back to the mainland. As a result, Guido only had two days to complete the painting and worked long hours, starting at 6am and finishing by 10pm with the help of flood lighting. Guido painted a lady on the side of the ship, wrapped up in a traditional wool jumper, to protect her from the cold Icelandic air. He tried to find something that suited the mood of the sea and the surroundings. The person is unknown and not famous, but the photo touched him in some way that he felt was the right image for the boat. And the Icelandic locals have related to the painting in their own way. People make their own story up and that’s the beauty of the piece. As the boat owner says; “every boat tells a story”. One person sees an Icelandic Mother who has lost her son to the sea and is looking down searching for him, another sees a guiding Angel protecting the ship and the people as it travels through the heavy seas. Do you remember Pt.2 from the 2nd (mass) update? Now -following Guido's counting- here is Pt.1 from the same settlement. 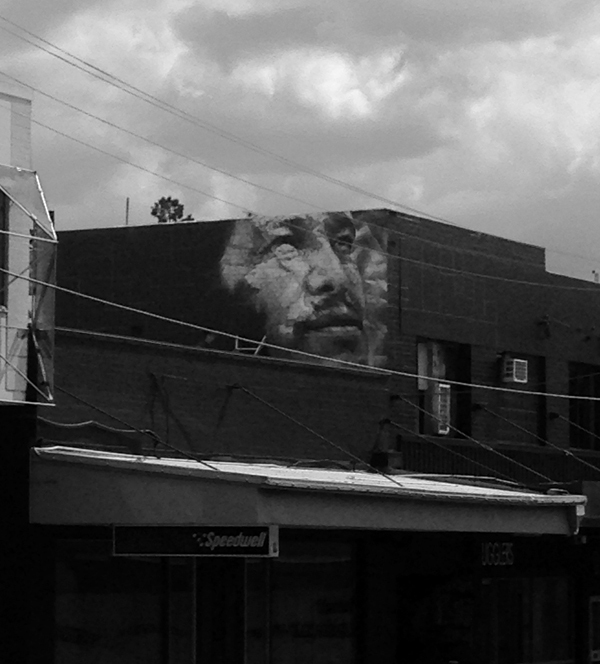 Lismore, New South Wales #2, Australia (2011.) - Relevant photo layer content on "non-existing" panoramio is available. No.49. 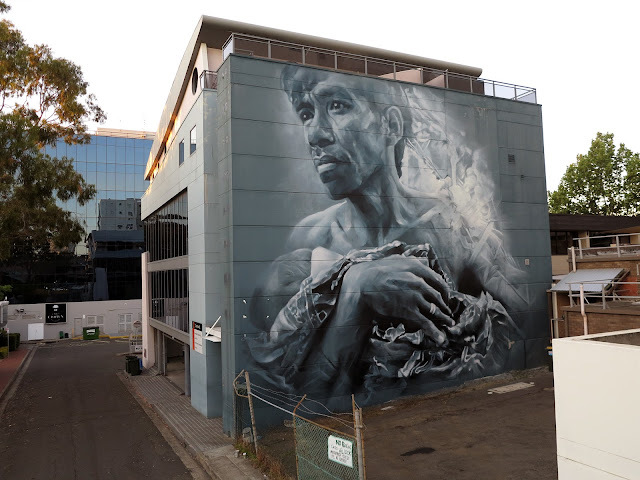 : - Manildra, Australia (2016.) / as far as I know this one is the most recent so far. Syzygy, I so appreciate the work you are doing on these murals. 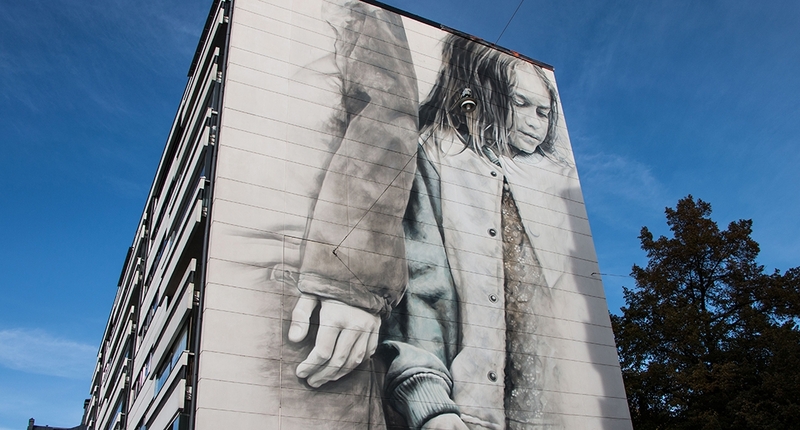 Guido van Helten (fascinating name!) 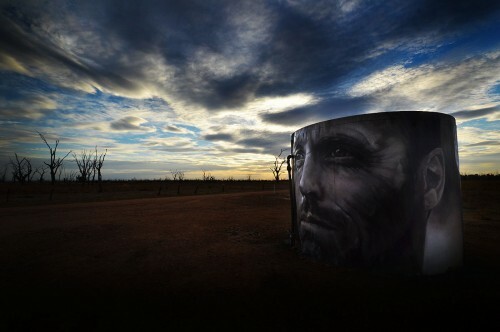 is brilliant and I wish he would come to my region, there are lots of grain silos to paint! I see there is even one in the unlikely small town of Ft. Smith, Arkansas, USA. Nearly all of his faces show tremendous emotion, wonderful to study and ponder. His statement about Muslim immigrants in Australia (in "Afghan Cameleer Said Kabool") is very moving. Your very welcome, but it is just "loads of fun..." as you have said before in another thread. No.52. : 'Unity' - Jacksonville, Florida - November 25, 2016. 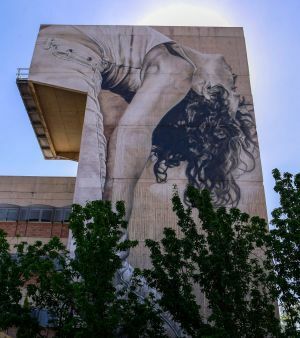 Guido van Helten's mural in Windsor took five days to transfer to the wall using spray paint, acrylics, paint brushes and a large cherry picker.